I’m in the process of moving my clients off this host. Things started off ok, but now all my client sites have constant timeouts/slow loads and frequent extended downtime (minutes to hours). I submitted a ticket. They responded in a timely manner saying it was fixed, but I still get constant timeouts, slow loads, and down time. Not worth the effort to keep it. Here is a typical 24 hour graph of uptime for sites I have hosted here. 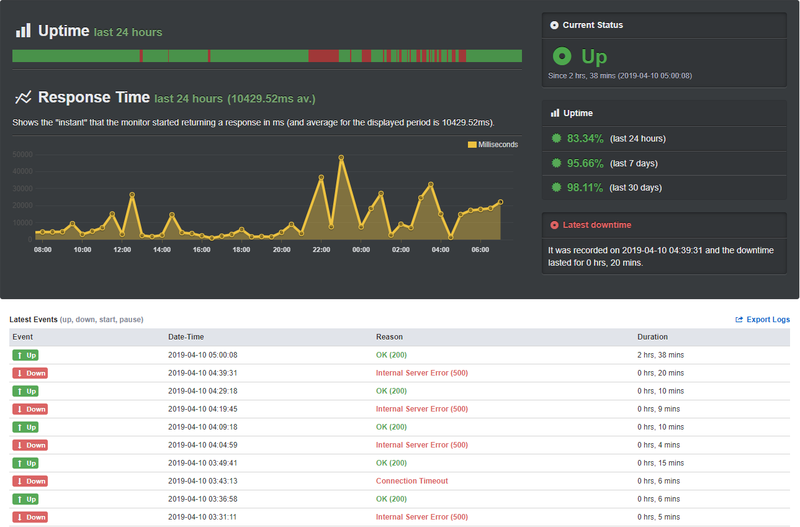 Graph and logs generated by uptime robot. Polling interval is 5 minutes. Hello Every One, I am Mrs. Marcela Williams, I’m from Ecuador , I quickly want to use this medium to shear a testimony on how God directed me to a Legit and real loan lender who have helped me and make my life turned from grass to grace, from being poor to a rich and successful man who can now boast of a healthy and wealthy life without stress or financial difficulties. After so many months of trying to get a loan on the internet and was scammed the sum of $17.214 i became so desperate in getting a loan from a legit loan lender online who will not add to my pains, then i decided to contact a friend of mine who recently got a loan online, we discussed about the issue and to our conclusion he told me about a Woman called Sarah John who is the C.E.O of Sarah John Loan Service, So i applied for a loan sum of (350.000.00 USD) with low interest rate of 3%, so the loan was approved easily without stress and all the preparations where made concerning the loan transfer and in less than two(3) days the loan was deposited into my bank account so i want to advice any one in need of a loan to quickly contact him via (sarahjohnfinancialservice@gmail.com) i pray that God add more blessings to his life and to everybody around him if you are interested you can contact her. Their support staff has been unable to identify or resolve contact downtime and server configuration issues since day one. I tried working with them for over 2 months but a downtown of less than 85% and page loads of over 5 seconds is unacceptable. I had to move on. Consider paying more for another provider. You get what you pay for.